In November 2012, 21-year-old Shaheen Dhada from Mumbai, India asked what she thought was a reasonable question. A powerful regional politician in India had passed away recently, and his supporters had decided that the appropriate way to mourn was to enforce a total curfew in Mumbai. Shaheen questioned the wisdom of shutting down India’s busiest city and economic capital to commemorate a dead leader. Unfortunately for her, the medium she used to express her disapproval was Facebook. A few hours later, in an incident that continues to shock even today, police arrived at her house to arrest her. Shaheen, and a friend of hers who had displayed the audacity to like Shaheen’s Facebook post, found themselves in jail awaiting prosecution under a legal provision that has become the blackest blot on India’s tryst with the Internet, Section 66A of the Information Technology Act. That seemingly reasonable queries from an engaged citizen in a democratic society can be the basis for criminal prosecution should come as no surprise to anyone who has studied Section 66A. Shaheen and her friend were merely the latest victims of a governmental policy that stood for stringent regulation of the content that could be expressed on the Internet. Section 66A was introduced in 2008 with the intention of dissuading people from abusing the massive voice and connectivity that the Internet empowered them with. However, the wide and ambiguous wording of this legal provision was problematic from the start. This legal provision was the manifestation of a policy that saw it fit to criminalize online communication that ranged from “grossly offensive” to those merely causing “annoyance or inconvenience.” In other words, this was a legal provision that betrayed the government’s fear of the power of the internet and its desire to control the same in a heavy-handed manner. Of course, it is difficult to fault the government for wanting to deter the abuse of the Internet. An examination of the recent history of India reveals a persuasive case for the same. For example, the circulation of malicious messaged and certain doctored photos on social media in 2012 resulted in increased regional tensions in the state of Karnataka, followed by a mass exodus of workers from the North Eastern states who feared for their safety. Likewise, it has been suggested that the ethnic conflict in the state of Assam in 2012 was partly the result of inflammatory content that was being shared online. These instances may seem to justify the retention of a mechanism to counter the misuse of the Internet, like Section 66A. However, they do not fully explain the extent to which the tyrannical power of this policy has been deployed in India. To better understand the indiscriminate application of Section 66A then, it is necessary to understand two key features of Internet policy-making in India. First, Internet policy in India is a child of reactionary impulses. Thus, when the government felt that grave harm could be unleashed over the Internet, it justified the continued, unrestrained application of a legal provision that criminalized broad classes of expression on the Internet. Conversely, when incidents such as the previously mentioned arrest of Shaheen Dhada finally resulted in a public uproar over the draconian nature of the law, the government’s reaction was to quickly announce that henceforth, only a senior police officer could authorize the lodging of a criminal complaint under Section 66A. Though touted as a measure to reduce the subjective and often disproportional application of Section 66A, what comes through clearly is that the primary concern of the government is to be seen as reacting to public outrage, rather than engaging in the more important task of reviewing the need for such a draconian law in the first place. Further, a reactionary approach to policy formulation means that Internet policy can be hijacked by momentary developments instead of being shaped as a coherent, long-term strategy towards the goal of maximizing the beneficial power of the Internet. The second feature of Internet policy-making in India that merits attention is the failure to recognize that Internet policy is not a standalone subject. Indeed, the extensive and undesirable application of Section 66A is influenced by a slew of factors, not all of which can be solved by focusing exclusively on Internet policy. For example, as mentioned above, the government attempted to restrain the widespread use of Section 66A by limiting the power of initiating prosecution to senior police officers. However, it is a widely-acknowledged fact that the police force in India is susceptible to political interference. When matters such as performance reviews and promotion assessments of the police officers are handled by politicians heading the concerned Ministries, it is difficult to believe that police officers can independently assess the need for a Section 66A prosecution. The failure to address issues such as this through policy reform means that the effectiveness of Internet policy will always be limited by other factors. The result of all this is that even after instances of the unwise application of Section 66A have grabbed public attention, the provision remains readily available to be used. And this has resulted in very real consequences for the users of the Internet in India. It is easy to see how Section 66A has a massive chilling effect on free speech. The average internet-user in India now has to think twice before clicking the “Send”, “Post”, “Share” or “Like” button online. This self-censorship is especially evident when it comes to expressing political disagreement online. There have been several notorious cases where political dissent or commentary has been the cause for prosecution under Section 66A. For example, Prof. Ambikesh Mahapatra was arrested under Section 66A for sharing a political cartoon that made fun of the serving Chief Minister of the state of Kolkata. Likewise, cartoonist Aseem Trivedi ended up in jail for drawing cartoons that depicted politicians as corrupt. To me, this is nothing short of a tragic state of affairs. Of all the forms of expression, political expression perhaps deserves the greatest immunity from sanctions, dealing as it does with fundamental issues of governance. And if the internet cannot be used for discussions of a political nature, that nullifies one of its greatest strengths – the ability to incentivize transparency and accountability from the government. As a citizen whose online expression is curtailed by the threats of possible imprisonment, I have often wondered why there has not been a greater push for reforming the policy behind Section 66A. The most common response I have received from those around me is that as a developing country suffering from many problems, India has greater priorities to focus on. I am often reassured that when fundamental issues of hunger, shelter and security are addressed, due attention will be paid to Internet policy reform. However, that strikes me as a false need for prioritization in the first place. The ability to freely express yourself on the Internet can be a powerful tool for solving basic problems. For example, when activists take to the Internet to critique the inefficient poverty-eradication policies of a serving politician, they should be praised for contributing constructive ideas to solve major problems rather than prosecuted for causing inconvenience or annoyance to political interests. And for that to happen, Section 66A in its present form needs to go. 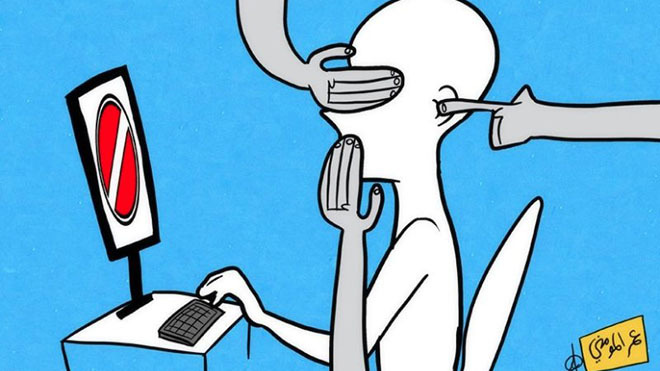 Ultimately, Section 66A represents a government policy that does not see the vast potential of online expression. If citizens like me have to modify our expressions on the Internet to suit the tastes of those wielding the power of Section 66A, that undermines the promised voice that the Internet can give to ordinary individuals. I look forward to a society where governmental policy does not leave me wondering whether posting this essay of mine online could result in me being arrested. And I look forward to a society which uses Internet policy to harness, and not suppress, the power of the Internet. Note: This post will be translated to English by Global Voices’ Russian team and published on both our Russian and English sites. На сегодняшний день всемирная сеть Интернет является наиболее мощным и эффективным децентрализованным средством коммуникации между жителями нашей планеты, которое является непосредственным воплощением и инструментом реализации такого права человека, как свобода слова. Вместе с этим, государственные аппараты различных стран мира, преследуя собственные цели, нарушают данное неотъемлемое право посредством принятия политических решений, влияющих на Интернет. В Российской Федерации, гражданином которой я являюсь, проблема воздействия политических сил на Интернет становится все более актуальной в связи с деятельностью таких организаций, как Лига Безопасного Интернета, Роскомнадзор и Российский союз правообладателей. Наиболее значимым примером деятельности данных организаций может выступить принятие Федерального закона №139-ФЗ в 2012 году. Данный закон был разработан Лигой Безопасного Интернета и реализуется с помощью Роскомнадзора. Положениями данного нормативно-правового акта было предусмотрено создание Единого реестра запрещенных сайтов, в который должны вноситься сетевые адреса сайтов и отдельных веб-страниц, содержащих материалы, способные причинить вред здоровью и развитию детей. Проблема Реестра в том, что блокируемые им сайты становятся недоступными для всех российских пользователей Интернета, без каких-либо возрастных ограничений, а несовершенство применяемых технологий при блокировании отдельных веб-страниц зачастую приводит к блокировке всего сайта. Подобным образом в российском сегменте Интернета блокировались такие сайты, как «Википедия», веб-сервис GitHub, видеохостинги Youtube и Vimeo; была заблокирована интернет-энциклопедия sportsWiki. Таким образом, рассматриваемый Федеральный Закон нарушает конституционное право граждан РФ на свободный поиск и получение информации, закрепленное в статье 29 Конституции РФ. Следующим шагом на пути к созданию цензурного режима в российском сегменте всемирной сети Интернет стало принятие Федерального закона №97-ФЗ в мае 2014 года. Этот закон получил в российском интернет-сообществе неофициальное название «закон о блогерах» по причине того, что его положения предусматривают обязательную регистрацию в Роскомнадзоре блогеров, которые в норме закона определяются как владельцы сайтов и страниц сайтов в интернете с суточной аудиторией более трех тысяч пользователей. Для полного понимания проблемы следует отметить, что из-за неопределенности понятия «блогер» под него подпадают не только физические, но и юридические лица, имеющие сайты с указанной посещаемостью. Однако главной проблемой являются введенные законом обязанности блогеров, по которым они должны разместить на своих сайте или странице сайта в сети «Интернет» свои фамилию и инициалы, а также электронный адрес, что напрямую нарушает их права на приватность и анонимность онлайн. Что характерно, в норме закона раскрыты лишь обязанности блогеров и санкции за их невыполнение (которые могут вызвать в том числе и уголовные меры наказания для нарушителей) и никоим образом не упомянуты их права. В конце также следует отметить, что избирательность блокируемых за нарушение данного закона блогов может говорить о политическом подтексте этого нормативно-правового акта. В качестве политического решения относительно российского интернет-сообщества можно также обозначить принятие Федерального Закона №187-ФЗ, регулирующего правоотношения в области лицензирования контента сайтов, и соответственно названный представителями СМИ как «антипиратский». Изначально данный закон подразумевал блокировку сайтов, содержащих нелицензионный контент всех видов информации, по просьбе правообладателей, однако в результате объединенного массового выступления российских интернет-пользователей, оставивших 100 000 подписей под петицией против внедрения «антипиратского» закона, и владельцев интернет-ресурсов, вроде представителей «Яндекс», Rambler&Co, Mail.Ru Group, действие норм закона было ограничено на видеопродукцию. Несмотря на этот факт, депутаты Государственной Думы Российской Федерации продолжили рассмотрение других вариантов «антипиратского» закона, что привело в результате к принятию 24 ноября 2014 года Федерального Закона №364-ФЗ. Основными новшествами данного закона, который должен вступить в силу 1 мая 2015 года, являются распространение области действия на все виды информации, кроме фотоизображений, введение возможности вечной блокировки интернет-ресурсов по двум обращениям с претензией к ним со стороны правообладателей, и возможность блокировки сайтов по сетевому адресу. Введение данных новшеств угрожает российскому сегменту всемирной сети Интернет тем, что технологии интернета разрешают существование нескольких сайтов на одном сетевом адресе, поэтому блокировка пиратских ресурсов может повлечь за собой блокировку добросовестных сайтов, не распространяющих нелицензионный контент. Еще одной угрозой выступает вечный характер блокировки, использование которых по отношению к исключительным правам является излишне строгой и непоследовательной мерой, особенно в совокупности с высокой вероятностью возможной блокировки добросовестных ресурсов. Таким образом, принятый «антипиратский» закон является крайне репрессивной мерой, чья целесообразность и эффективность мало оправдана и чья деятельность может повредить интернет-пользователям, интернет-ресурсам и самим правообладателям. Помимо уже принятых федеральных законов, ограничивающих право россиян на свободный доступ к информации, в ближайшем будущем в России планируется реализовать ряд политических мер, способствующих, на мой взгляд, развитию цензуры. Главной такой мерой может оказаться принятие по инициативе Лиги Безопасного Интернета закона об обязательной фильтрации всего контента на уровне интернет-провайдера. Это означает, что все страницы, запрашиваемые российскими интернет-пользователями, будут в реальном времени обрабатываться на предмет содержания запрещенного контента. Такая мера катастрофически скажется на скорости интернет-соединения, затраты на установку фильтрационного софта по прогнозам обойдутся провайдерам в несколько миллиардов долларов, а использование в качестве фильтров «белых списков», которые предлагаются создать российскими законодательными органами, будет означать возможность доступа только к тем ресурсам, которые будут включены в такие списки, что позволит утверждать об официальном создании цензуры в России. Также Лига Безопасного Интернета рассматривает проект об отключении образовательных учреждений от всемирной сети и создание специальных образовательных порталов, что опять же противоречит Конституции РФ. Собственные проекты разрабатывает и Российский союз правообладателей — его представители хотят реализовать концепцию глобальной лицензии, в соответствии с которой глобальную лицензию будут получать интернет-провайдеры: они будут вынуждены платить за нее фиксированный сбор в пользу правообладателей. Пользователи в данной ситуации получат неограниченный доступ к тому контенту, чей владелец предоставил оператору глобальную лицензию. Это отрицательно скажется на интернет-провайдерах, если они не смогут договориться с правообладателями, т.к. это приведет к не оправданному экономическими причинами росту цен за пользование интернет-услугами. Исходя из всего этого материала, следует признать, что в последние годы в России четко прослеживается тенденция ограничения доступа к информации в интернете для всех пользователей под явно преувеличенным предлогом защиты детей. Данная тенденция выражается в реализации политических решений об интернете, которые разрабатываются некоммерческими общественными организациями и принимаются федеральными органами власти, но в силу своего административного характера и отсутствия обсуждения с российским интернет-сообществом в результате оказываются непоследовательными и несоответствующими современным реалиям. Я надеюсь, что данное эссе в частности и проект Global Voices 2015 в целом поможет моей стране в создании конструктивного диалога с интернет-пользователями и принятии верных политических решений об интернете в будущем. For a country reeling from the aftermath of a three decade long conflict, Sri Lanka has come a long way since 2009 in preserving the bodily security of citizens from terrorists. However, the vestiges of the measures that were in place during wartime still hover over the civilian discourse serving the manifold commands that fall within loosely defined national security goals. Internet censorship is one of the tools that was deployed to combat terrorist disinformation campaigns that remain operational in peace time. However, there is no policy and guideline that covers censorship. All that is required is a secret order delivered secretly to internet service providers that blocks access to any specified website to any Sri Lankan user. Respectable mainstream online news webistes as Colombotelegraph and Lankaenews have been shut down for the Sri Lankan public. The impact is most acute in a climate where print media and television and radio stations practice self-censorship on top of the government policies. When racist mobs were unleashing violence in Aluthgama against the muslim minority in the south, the mainstream media eerily remained silent for over two days and pretended nothing happened. Those who had access to proxy servers obtained information from banned websites. The problem with squeezing the general public to seek alternative information sources is that they are usually driven by an agenda. For example, a number of banned websites carried news items that falsely stated that Muslims have murdered child monks. This false belief fuelled further violence. The implication for rule of law is significant. None of these secret orders accompany rational justification behind the censorship. Wartime urgency and secrecy has permeated civilian governance in peacetime. There is no possibility that website operators could challenge the order to have censorship imposed on the ISPs. Even when they are challenged, the blank statement that national security interests demand the censorship would be accepted without due scrutiny. For a country that had a vibrant judiciary guarding the rule of law from 1994 to 2000 even during an era marked with conflict, this state of affairs in peacetime is saddening and regressive. Sri Lankans have remarkable mobile and telephone penetration. It has almost 64% mobile penetration. This remarkable statistic should usually auger well for democratization of new media. The vested interests of those powerful forces that usually retain the reins over information to the public should be hypothetically challenged by anyone with a keyboard. However, the Promised Land is kept away by the operation of secretive regulations that shut down websites that contain any information even remotely skeptical about the incumbent family being messiahs of the country. There is a serious dearth in the information that is made available to the public. For example, when mega public contracts were awarded as unsolicited contracts in gross violation of government regulations, no significant discussions took place. However, this dearth that should otherwise be fertile territory for public discussion is kept arid by Internet censorship. Human rights were relegated into the dungeons during the war. There was a grudging admission by the educated middleclass that this maybe necessary for the war effort. However, in peacetime, such deference should be owed to the government. Internet censorship disallows any serious discussion in the English language about mass scale human rights violations. For example, when mass graves were discovered the mainstream media glossed over the facts. The leftist newspapers that were published in the vernacular languages raised the issue. But the educated middleclass and the international community were insulated from these discussions because the English language newspapers lived and worked in practiced ignorance of these details. Internet censorship made it difficult for any serious discussion on human rights by web journals. The lack of discussion on human rights has generated serious repercussions in the public discourse. This has made it possible for the government to characterize those who engage in human rights discussion as subversive elements. Therefore, the government has been able to act with impunity and evade discussion because of the culture of fear that has congealed around the censorship regime. The government has ostensibly created Lessons Learnt and Reconciliation Commission (LLRC) to promote Human Rights in the post conflict environment. Moreover, the LLRC recommendations include promotion of journalistic freedoms as a recommendation. The UN Human Rights Committee has pursued investigations into war crimes. However, the information about the last stages of the war is not forthcoming from Sri Lankans. The reason is that there is no avenue to express either facts or opinions. The government is thus able to manipulate the sources of information by precipitating self-censorship and Internet censorship. In conclusion, Internet censorship has actual far-reaching implications for Human Rights, Rule of Law, Accountability and post-conflict development. The fruits of mass internet access and democratization of information outlets have been denied because of far-reaching censorship.